The pool is currently suffering terribly due to the breakdown of its filtration pumps (now fixed apparently) after a very busy sunny weekend. You can see the difference in my comparison picture from a year ago. Tomorrow Friday 24th July it might be best to call them 01223 302579 to check the situation before going. The pool is also suffering it’s annual problems with the hot showers. This year its the turn of the ladies to have a cold one! Maybe instead of installing a sauna, which apparently should be operational ‘soon’ the money could have been better spent on refurbishing the showers and pump room! I’ve just got out of Letchworth pool and they’re having a similar problem – green bottom…. This entry was posted in News and tagged cloudy on July 23, 2015 by GJ. Summer time and the living is easy! 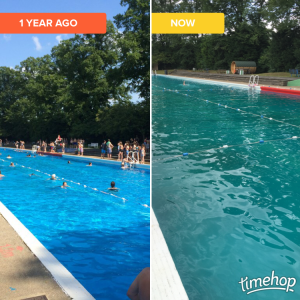 .. and the pool water is LOVELY (22 degrees, so come along and COOL DOWN after a hot day and ENJOY! Come on down to Jesus Green Swimming Pool this Saturday 4 July between 6pm and 8.30pm for a mellow summer evening of music, community song, swimming and picnicking at the 11th annual Talking in Tune Sing and Swim for Water Aid, one of the highlights of the Cambridge Summer Social Calendar! Bring your kids, grannies, pals and come and hang out for a couple of hours in the finest lidos of the land. The weather forecast is for golden evening sunshine after a hot day. We have a great evening line up for you. Musicians include the Andy Bowie Jazz Trio, Tom Ling, Ranjan Vasudevan and Pete Towers with his amazing sink guitar who will all play summer music to us as we swim and picnic. (Swimming to live music is an experience not to be missed!) Singers from ReSound and Good Vibrations Choir, Global Harmony Community Singers, Milton Road Primary School and Shout Aloud will sing poolside and the evening will end with a poolside community singalong of Summer and Watery songs with backing band, with lyric sheets provided. Tickets cost £7, (£5 concessions for people on a low income, £3 for school age children) at the door, or phone 01223 573288, email talkingintune@ntlworld.com to beat the queue. Bring along your picnics (no glass bottles please), swimming kits, rugs and blankets; Yummy Home-made cakes and snacks will be on sale for WaterAid . The pool cafe will also be open. 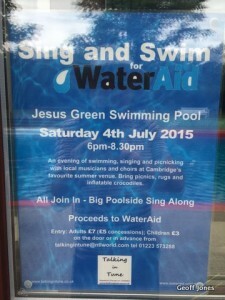 Inflatable crocodiles, whales and dolphins etc are welcome and synchronised swimming and singing will be encouraged! Please note: the pool will close for public swimming at 5.30pm on the day. If you are already there, and wish to stay sitting poolside (the pool itself will be swimmer-free for half an hour to give the staff a break) , you are welcome to do that – we will come and sell you tickets ! This entry was posted in News on July 2, 2015 by GJ.